What would you do if you couldn’t remember anything beyond one year ago? What if you also had a strange inability to die? You know this, because you have died—exactly nine times in that last year—and come right back to life. Well, if you’re Trent… well, just Trent.. Then you don’t have a last name, because that’s something that would tell you a little about where you came from. You’d also find a place among New York’s underbelly, moonlighting as the “good dog” of the crime boss known only as “Underwood.” You work for this scum bag, because he promises to tell you who you are and why you can’t remember anything from your life before you met him. However, when you accidentally freak out in the middle of a job over a werewolf and a couple of gargoyles and accidentally save the life of your target, things start to get ugly. I’d like to introduce you to my friend Trent. The first thing you’ve gotta know about Trent is that he’s a badass. No, not in the “I drive a humvee and wear my sunglasses indoors” kind of way, but the strong, silent way that a Great White Shark or an African Rhinoceros is a badass. Trent lets his actions do his talking. He’s constantly being consumed by the questions inside him and everything else just pisses him off. Oh yeah, also, he can’t sleep. Like, at all. So, instead he stays up all night brooding over black-and-white movies and a terrible book he found in the rain, which makes him progressively more badass as time goes on. In the middle of one of his jobs, he sees a couple of “men in trench coats” who turn out to be freaking gargoyles attacking a five-foot-nothing chick with pointed ears. He pulls his gun and throws a few rounds at one of the things before he realizes that it's completely ineffective. In the middle of a skiff with one of the ugly things, Trent picks up a magical staff with a mummified fist at one end, and cracks off a home run. This begins his journey on to Underwood’s bad side and into a world full of everything you could only imagine. New York City is not the little ray of sunshine it seems to be after all. In Dying Is My Business, Kaufmann has filled it with vampires, werewolves, zombies, sorcery, dragons, and all kinds of other things that piss Trent off. 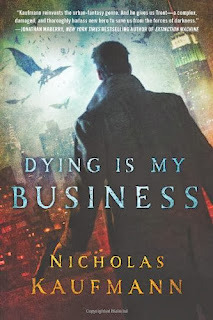 Dying Is My Business is, admittedly, my first rodeo with Urban Fantasy, but I think if you’re gonna do anything, you’ve gotta go all in. This entire novel takes place over the course of just a few days, but it’s jam-packed with explosions, gun fights, gigantic monsters, and even a little dash of godlike power in case you were wondering. However, that’s just the surface level. Kaufmann has created a seriously complex and interesting character to follow through it all in Trent, and has surrounded him with a supporting cast of moody, counter-culture anti-heroes who make this one of the best books I've ever enjoyed. Sure, it has its flaws. For example, Phillip, the novel’s vampire, is a pretty convincing photocopy of BLADE, complete with head-to-toe black and shades. I dig everything about Phillip, but I gotta speak the truth. Also, the book moves so fast that it almost forgets to wrap up a couple of questions that are introduced along the way. However, this is just the first in what I hope is a long, long series which should wrap all of those ends up nicely. In short, Dying Is My Business will grab you by the throat and throw you headlong into a version of New York City you never knew existed. I hope you don’t like sleep, because this is one book you won’t be putting down until you've finished it. Even then, you’ll be sitting there wondering where your life leads now that it's over. 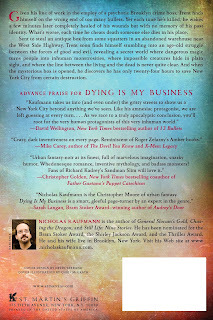 Pick up your copy of Nicholas Kaufmann’s Dying Is My Business from Amazon, Overstock, Wal-mart, Powell’s Books, Books-A-Million, IndieBound, Barnes&Noble, or pretty much anywhere books are sold. If you’re still reading this, you’re not reading Dying Is My Business. Do yourself a favor, and go get your copy now.